One of the nicest things about organising and running the workshop - was seeing how other enthusiasts took the basic idea in the form of instructions and materials, then made it all their own!!! 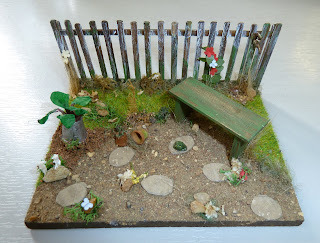 Janet has very kindly sent a photo of her 1/24th scale little garden which she put the finishing touches to at home - and it's lovely!! We're delighted to see how each garden has emerged from those original bits of wood and bags of landscaping ... and the way that personal miniature treasures plus different choices in additional flowers and plants have made them so individual. We have just finished working on and photographing the 1/12th scale prototype for the next project "Down the Little Garden Path", using some techniques and materials that are different again....... but more of that later.